Italian chemicals production increased 1.2% in January–October 2016. However, in Q4 of 2016 growth slowed down with stocks of raw materials at low levels, so that in 2016 chemicals production increased just 0.9% to a value of EUR 85 billion - a continued recovery without acceleration. In 2016 chemicals exports increased 2.1% in volume, while export values remained substantial despite falling prices. In particular exports of speciality chemicals (paints, inks and adhesives, detergents and cosmetics) showed a robust growth rate of 5.2%. Domestic demand continued to increase (up 1.4% in volume), although at a slower pace than in 2015 (up 2.5%), thanks to the positive performance of the automotive sector as well as growth in the pharmaceuticals and rubber/plastics segments. In addition, the furniture industry registered a rebound and the negative trend in chemicals demand from the construction industry bottomed out. 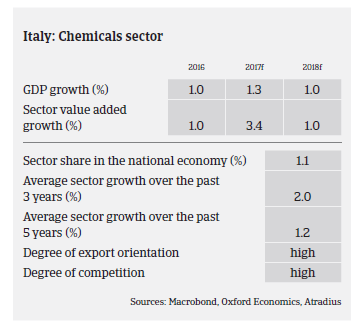 In 2017 Italian chemicals production is expected to increase 1.2%, with domestic demand showing a growth rate similar to 2016 (up 1.3%) and a modest acceleration in export growth (up 2.5%). Expected improvements in domestic demand will gradually reduce the difference between strongly export-oriented chemicals businesses and (thus far, more vulnerable) companies highly dependent on the domestic market. That said, as domestic demand still remains below the pre-crisis level and overcapacities continue, competition in the low value chemicals segment remains high. In contrast, it is reduced in the high value segment due to high entry barriers. In this segment chemicals companies have been able to get close to pre-crisis levels as value added has grown by 4.7% between 2007 and 2016, even by 16% since 2012, mainly due to strong performance in overseas markets. 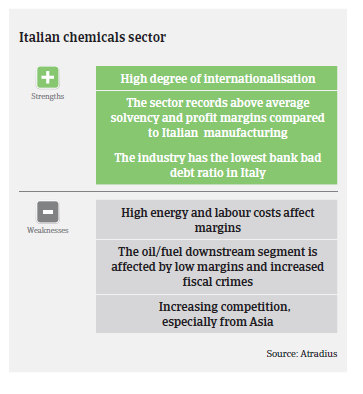 On average, payments in the Italian chemicals sector take around 60 days. Payment experience is good, and the level of protracted payments has been low over the past couple of years. Payments generally occur on time. The level of payment delays and insolvencies is low in the Italian chemicals/pharmaceuticals sector, and this is expected to remain generally unchanged in H2 of 2017. However, we expect non-payments to increase in the oil/fuel wholesalers segment, which is affected by low profitability due to heavy taxation (VAT amounts to 21%-22%, and other excises on fuels reach 68% of the final sales price of fuels) and international competition. Fiscal crimes (i.e. import of fuel from illegal markets to avoid VAT payments) have increased, while public authorities have started to investigate these resulting in the bank accounts of many fuel wholesalers being blocked. 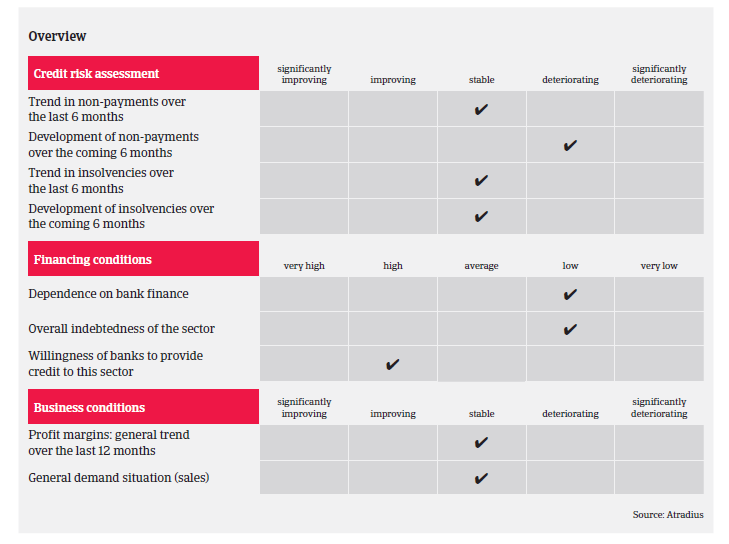 Considering the generally positive outlook for the industry, the low level of bank bad debts and the above-average solvency of many businesses, our underwriting approach to the Italian chemicals sector remains relaxed. However, subsectors and businesses dependent on construction, construction materials and consumer durables still require particular attention. Compared to producers, chemicals wholesalers generally show lower solvency and higher gearing ratios to finance their working capital needs. Due to the issues mentioned above a more cautious underwriting approach is applied to wholesalers of fuels. Also in focus are wholesalers and retailers of pharmaceuticals, which are dependent on public healthcare expenditure and suffer from long payment duration by public bodies and decreased margins.